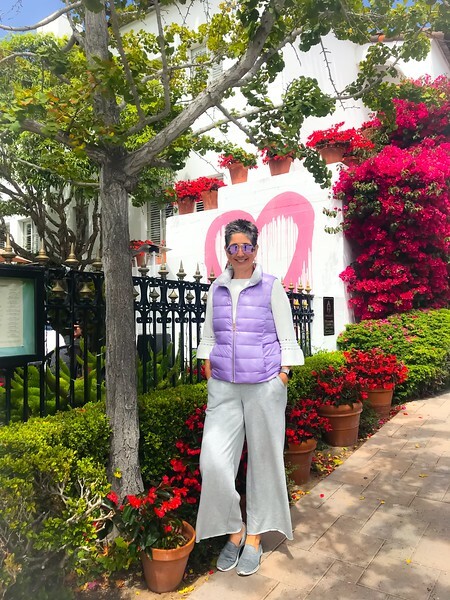 Emily stands by the ginkgo tree, aside the Cypress Inn, that inspired her 'Cascade' wall installation. 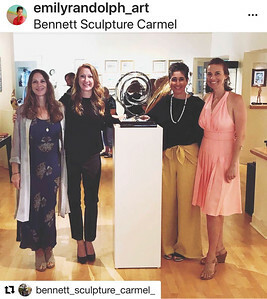 On July 14, 2018 I unveiled 'Cascade' at the Bennett Sculpture Carmel gallery in beautiful Carmel-by-the-Sea, CA. The art installation was the culmination of #The100DayProject challenge. 'Challenge' is the right word, too. I had many things to 'invent' before I could bring the project to fruition. 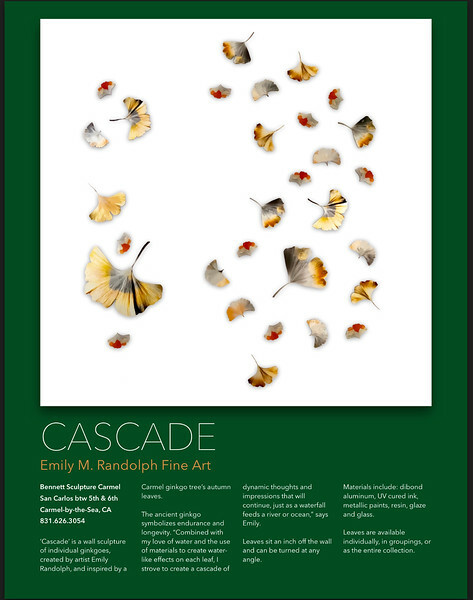 'Cascade' was inspired by a ginkgo tree that greets all passersby of the patio at the Cypress Inn. I was always enthralled to see this beautiful tree, but it was particularly in all its glory one autumn day in 2017. The falling leaves were an array of orange and yellow, and I scooped many off the ground as if they were indeed nuggets of gold. Carefully, I photographed each one and then folded them into a book for safe keeping, not knowing what I would do with these treasures. 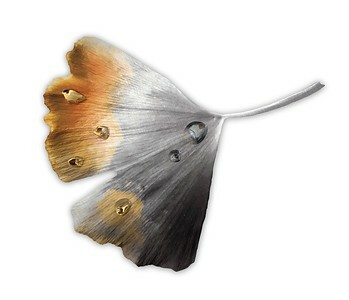 I first started creating my ginkgos with a chance collaboration with mixed-media artist Kathy Hope. She had done a beautiful panel in greys and whites and asked me what I could add to the project. I immediately thought of my ginkgoes, still in concept stage. 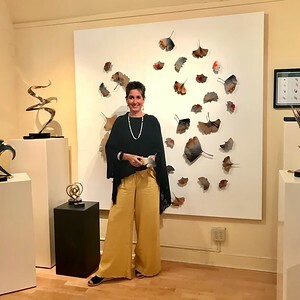 She loved them, too, so I created the sculptures and the artwork came together seamlessly and sold right away. From there, I stretched myself to create panels for my artwork, as well, creating three more pieces incorporating the metal ginkgoes. 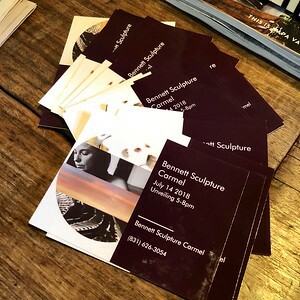 It was during this time that the Bennett Sculpture Carmel challenged its artists to participate in #The100DayProject. 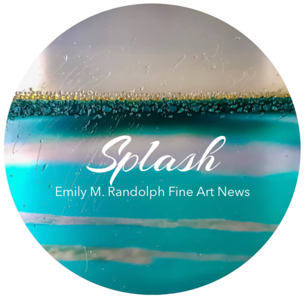 I raised my hand and offered up an installation of freestanding ginkgoes, each created with a different treatment of resin, glaze, glass 'dewdrops' and metallic paint. The largest challenge was figuring out how to get the ginkgoes on the wall! After many conversations with 'experts' and through many failed attempts, I finally hit upon my own solution: using stainless steel standoffs that allow the user to turn the ginkgoes at will, thereby making the installation interactive. The standoffs also create deep shadows, which the user can manipulate with lighting. Though the installation is available as sold or designed by commission, patrons can also buy individual leaves or small sets. 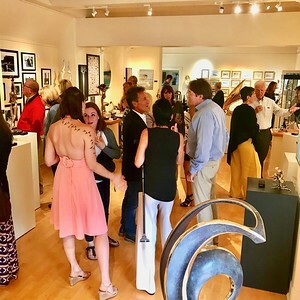 Each grouping will be unique and can be installed creatively at the whim of the buyer. 'Cascade' was inspired by the falling, golden autumn leaves of a ginkgo tree outside the patio of the Cypress Inn in Carmel. Though the ginkgo leaf is distinguishable from all others, each ginkgo leaf is different. 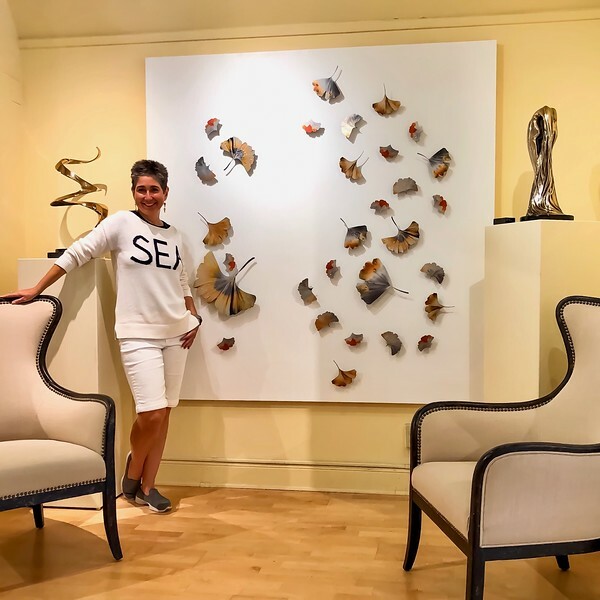 The installation consists of 50 leaves in total, all individually printed on aluminum and hand painted or embellished with resin, glaze or glass. They float off the wall using stainless steel mounts for easy placement and rotation at will. All are signed and numbered.